Journey deeper into the magical world of the hobbit, Bilbo Baggins, through exclusive interviews with director Peter Jackson, Martin Freeman, Orlando Bloom and principal filmmakers and new cast members, including Stephen Fry as the Master of Lake-town, Evangeline Lilly, who plays Tauriel the Elf, and Benedict Cumberbatch, who reveals film-making secrets about playing the dragon, Smaug. Richly illustrated with a treasure trove of behind-the-scenes photos of the actors, creatures and costumes, and numerous special effects scenes, this essential guide is an indispensable companion to the second film in the award-winning trilogy. BRIAN SIBLEY is a writer and broadcaster with a life-long interest in fantasy books and cinema. 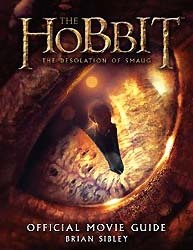 His fascination with J. R. R. Tolkien and the myths and history of Middle-earth first led to his critically-acclaimed 26-part BBC radio dramatisation of The Lord of the Rings in which the role of Frodo was played by Ian Holm, who went on to portray Bilbo in Peter Jackson's The Lord of the Rings Trilogy, a role he is now reprising in The Hobbit. Following on from his award-winning accounts of the making of Peter Jackson's The Lord of the Rings Trilogy and his official biography, Peter Jackson: A Filmmaker's Journey, Brian returns to chronicle the making of the The Hobbit.